Positives: Pitched in more games than in the rest of his career combined and, except for a procedural move around the All-Star Break, spent the entire season with the Cardinals….started the season with a 2.08 ERA after three starts….had back-to-back seven inning outings in May, but his best game may have been in San Francisco in June, when he allowed two runs and struck out seven in eight innings….allowed a .720 OPS away from Busch Stadium….batters hit .253 in the first half against him….had a 3.00 ERA in July….batters had a .689 OPS when he received two or less runs of support….third-place batters had a .718 OPS against him….if batters took the first pitch, they had a .770 OPS, though 15 of his home runs allowed came in that situation….kept batters to a .596 OPS when he was ahead in the count….batters hit .226 leading off an inning….had a 3.72 ERA in two games against the Brewers. Negatives: Was removed from the starting rotation in August, in part because he went four innings or less in three of his last six starts….put up a 3.81 ERA in those starts, but batters hit .316 against him….gave up four or more runs in 10 of his 25 starts, including one six-run game and one eight-run game….didn’t fair well as a reliever, with an 10.29 ERA in five outings….batters had a 1.189 OPS against him in relief….did not pitch the last two weeks….lefties hit .291 against him….went 1-5 with a 5.74 ERA in Busch Stadium….skewed by his relieving, had a 5.67 ERA in the second half….had an 11.57 ERA in seven September innings….sixth place hitters had a 1.013 OPS….if batters swung at the first pitch they hit .324….if they hit the first pitch they posted a .995 OPS….batters put up a 1.012 OPS when they were ahead in the count….allowed an .877 OPS when runners were in scoring position….in eight plate appearances when he faced a batter for the second time as a reliever, .429/.500/1.429 slash line….allowed a .311 average on ground balls….had a 7.50 ERA in four games against the Cubs. 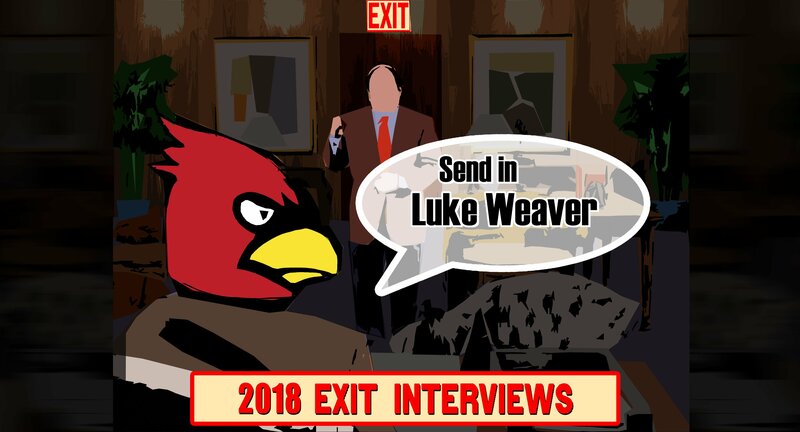 Overview: Luke Weaver will be 26 years old late in the season next year. Let’s try to keep that in mind. This was the first full season for Weaver in the bigs and it’s not surprising that there were some bumps in the road, though the magnitude of these bumps is definitely concerning. He’s got youth and ability on his side, he’s just got to figure out how to really use it. Weaver had some good runs this year, but the consistency wasn’t there. There was a stretch where he allowed two runs a game, but the innings varied from 2.2 to 6. There was a lot of fluctuation on what Weaver would bring to the game every day and that made it tough to plan bullpen usage and the like. There are still some good stats in there and I’m sure Joe Schwarz can talk about what he needs to do to get back to that prospect level we expected from him. Outlook: I can’t see the Cardinals selling low on Weaver this winter, not even as a throw-in on a bigger package, so he should be on the 25-man roster next season. What role he’ll have, that’s a different story. The starting rotation will likely be Carlos Martinez, Miles Mikolas, Jack Flaherty, Michael Wacha, and Adam Wainwright, with Alex Reyes ready if necessary. How does Weaver squeeze into that rotation? It’s hard to see a way. Kyle Reis has been talking about Weaver being a strong relief type, maybe in the vein of a Joe Kelly without the overwhelming heat. Can he get into that mindset? The shift to the bullpen this season didn’t go very well, but that was also at the end of a long season. Maybe if he starts in the bullpen he can be more effective. If he builds up some trade value, the Cards might entertain dealing him at the deadline depending on how things go but that’s a long way down the road.